Fido and Friend in Five: Maria Goodavage and Jake! "Military working dogs are amazing in every aspect, and even more so when you realize that they risk their lives and save yours, all so they can have a ball." Air Force Staff Sergeant, Christine Campos, Dog Handler. Thus opens the New York Times best selling, Soldier Dogs: The Untold Story of America's Canine Heroes, by Maria Goodavage. I first heard about Maria's book on my favorite television show, "The Daily Show with Jon Stewart." Jon always had great interviews with authors about their books, but his interview with Maria was particularly fascinating. You can watch the interview here. As soon as the interview was over, I said to my husband, "We have to read that book!" And we did. In Soldier Dogs, Maria explores the training of and relationship between these highly trained and specialized dogs and their handlers. Goodavage (pronounced Good-AH-Vig), a former USA Today reporter and news editor at Say Media's www.dogster.com, interviewed military working dog (MWD) handlers, trainers, dog behaviorists, scientists, officials in the Department of Defense, and a myriad of folks in the military who's lives are touched (and often saved) by these dogs. MWD have played a crucial role in the wars in Afghanistan and Iraq because of their ability to sniff out improvised explosive devices (IEDs). 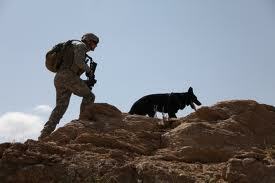 In 2010, bomb sniffing dogs are credited with finding more than 12,500 pounds of explosives in Afghanistan alone. One can only imagine how many lives and limbs were saved! As one MWD handler so aptly said, "My life is in my dog's nose." 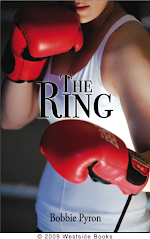 Maria not only interviewed tons of different people for the book, she had unprecedented access to the training camp the dogs and then the dog and handler teams go to at the Yuma Proving Grounds. The course is grueling for both dog and soldier. But in the end, if they make the cut, they will be a team that will save countless lives. 1. How did you and Jake find each other? 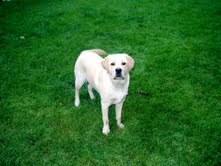 After our old dog Joe died in 2002, I couldn't bear the thought of getting another dog for keeps for a while. But we all missed having a dog around, so about a month after Joe died we started looking to foster a dog. We located a small rescue that said they had a sweet 6-month-old yellow Lab type of dog who needed temporary digs 'til an adoption fair. The minute he walked in the door, I was done for. My eyes misted up, and I knew he was a keeper. There was something about him, his happy disposition, his looking like he was saying "Oh goody, I'm HOME!" that got me right in the soul. We "fostered" him for a couple of weeks then told them that they didn't have to bother taking him to the adoption fair. Yes, I am a failed foster. Jake is now 10, and it was one of the best decisions I ever made. 2. What makes Jake's tail wag? Everything. Jake loves life. He is the poster child for living in the moment, happily enjoying everything around him. Food makes him wag. I make him wag. Strangers make him wag. Flying birds make him wag. The words "car," "chicken," "cheese," "treat," and "food" make him wag. The word "bath" makes him run away. Travels With Charley, by John Steinbeck, got me started on my lifelong love of good books and traveling with a dog at my side. 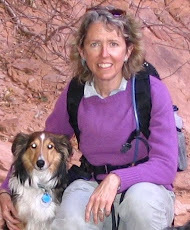 I started my "Dog Lover's Companion" dog guidebook series in 1992 based in part on my longtime enjoyment of Steinbeck's book. He crossed the United States in his camper truck with his blue poodle, and I drove up and down and all around California in my rusty little pickup truck and my dog Joe. 4. If Jake could change just one thing about you, what would it be? He would greatly like me to make room for him on the bed. The poor fellow has to make do with his four dog beds, the couch, and very own Ikea arm chair, complete with ottoman. Jake is sunshine and happiness. 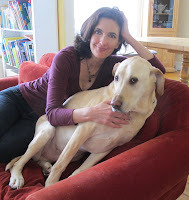 I hope readers of this little blog of mine know I rarely use it as a platform or soapbox, except to celebrate the unique bond between dogs and their people. But I got a bit of a fire lit under my you-know-what when I read Maria's book. 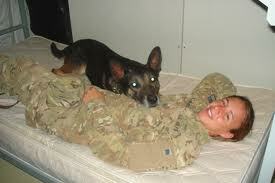 Did you know that the military classifies these four-footed heroes as equipment? It's true! Maria has been working hard with several other organizations to get this gross error rectified. 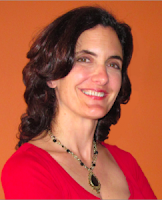 Please visit her website to find out more about this.Click on the Resources tab. It's truly a disgrace. Maria just recently informed me that a bill (the Canine Members of the Armed Forces Act) that was being introduced into congress to reclassify the dogs has now been enfolded into a larger military bill which just passed in Congress. Keep your fingers and toes crossed that it does likewise in the Senate! Better yet, contact your senator and tell them these invaluable members of the military need to be recognized for what they are: Soldier Dogs. Fido and Friend in Five: Jackie Davies and Harley! So about a month ago, I'm on the phone with my lovely agent talking about the first draft of my work in progress. Oh, the work had much to be admired ("admired"? ), my agent said. And the writing was absolutely glorious. But there was, she said in her New-York-gentle-way, some emotional element missing. She kept referring to this book, The Lemonade War, that "just got it right." "Oh, it's a wonderful book," she enthused. "I just love that book!" Jealousy reared its ugly head. Could it really be that good? Grudgingly, I checked the audiobook of Jackie Davie's Lemonade War out from my library to listen to. I figured it probably wasn't that good, but it would make my agent happy if I read it. I am here (quite humbly) today to tell you it was that good. And yes, I ended up loving the book as well. The Lemonade War is about Evan Treski, who is "people smart," and his younger sister, Jessie, who is math smart. Decoding other people's emotions is her weakest subject. Just a week before school starts, a rift develops between Evan and Jessie. An all-out war ensues to see who can make the most money selling at a lemonade stand in just five days. With a light touch, Davies turns a typical brother- sister rivalry story into a poignant exploration of the complexities of emotion, change, and that sibling bond. There's a good reason The Lemonade War has either won or been nominated for just about every state's children's book award out there! Thankfully, Jackie continued Evan and Jessie's story in The Lemonade Thief and the latest edition to the trilogy, The Bell Bandit. She's also written five other novels and picture books. 1. How did you and Harley find each other? Harley was born one of nine puppies on a lovely farm in Southern New Hampshire on September 11, 2003. When it was my turn to choose from the litter, there were just two puppies left, both of them female. One was clearly an Alpha—very outgoing, energetic, fearless, funny. The other dog was shy at first. She stayed in her quiet corner, only venturing out to the center of the pen when the more rambunctious puppy settled down. Then she cuddled up to me. Here was a dog who was looking for a quiet life with lots of love. That’s the dog I took home. 2. What makes Harley's tail wag? People! Other dogs! She is the most endlessly sociable dog you’ve ever met. Her perpetual goal: to earn a tummy rub. She’ll do anything for you if you scratch her belly. 3. 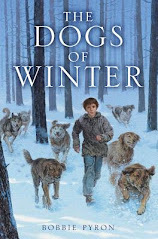 What's your all-time favorite dog story/novel? Hands down: Bark, George by Jules Feiffer. It’s a hilarious picture book with outrageous pictures and a surprise plot twist at the end. I use this book in my graduate level classes to explore the relationship between text and illustration in children’s books. 4. If Harley could change just one thing about you, what would it be? Oh, she’d like me to be much less busy so that I could devote all my time to rubbing her stomach. She probably also wishes I weren’t so allergic to poison ivy so that we could visit her favorite wooded dog park in the summer time. (It’s filled with poison ivy, so we avoid it from May to September.) Other than that, she’s a very forgiving and accepting dog. I wish I could be as non-judgmental as she is. Harley makes me laugh daily. Thanks so much to Jackie and Harley for visiting with Fido and Friend in Five! 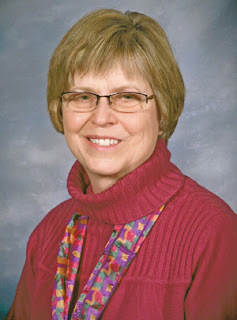 Be sure to check out Jackie's website for all the latest on her books, her awards, and her writing life. Nothing makes an author feel like they're on the right track with their writing than receiving a packet of fan letters from her readers! I received an email last week from a second grade teacher in Virginia. Her class had just finished reading A Dog's Way Home. I am a second grade teacher and this year my high level readers ended the year by reading your book A Dog's Way Home. They loved it! I am also a Sheltie owner so we were able to discuss Shelties and they were able to see my dogs. My four top readers have written you letters. I would like to send them to you. Could you email me the best address to do that? So of course, I sent her my mailing address right away. A few days later, after a rather crappy day at work, I received this packet of letters from her students. One even included a photo of her with her blind dog! It made my whole week! Thanks so much to these special readers--Brooklyn, Olivia, Colin, and Kaden--from Chancellor Elementary! You guys made my week! 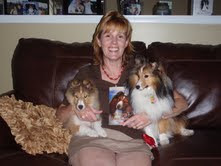 Fido and Friend in Five: Marion Dane Bauer and Dawn! Once she owned a boy. So begins Marion Dane Bauer's splendid new book, Little Dog, Lost. 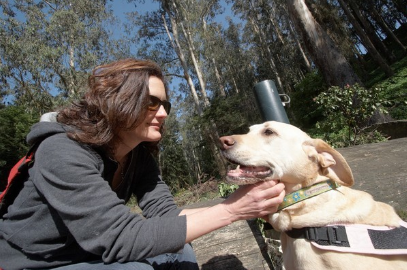 This isn't just another "lost dog story." Of course it wouldn't be: it's by Marion Dane Bauer, author of over eighty books including the Newbery Honor-winner On My Honor. One of the many things that made me love this book is the fact that it's written in free verse. This style lends such a power to each and every word, just like poetry or a really good picture book. Or perhaps the way a dog would experience the world. Now there have been quite a lot of books written this way, but not all succeed. Marion's book succeeds in spades. Marion told me in our emails that when she first conceived of writing the book in this style, she wasn't sure she could pull it off. But once she "plunged in" she loved it! 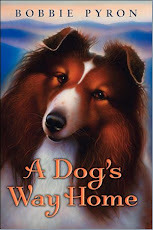 And of course, it's not just a story about a lost dog looking for a home. It's also a story about how we're all, in one way or another, looking for some kind of connection, a heart connection, to make our world full. 1. How did you and Dawn find each other? 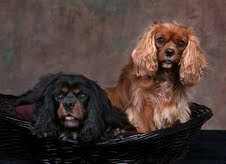 I found myself living with my older cavalier King Charles spaniel, a black and tan named Sunshine'n'Shadow. Sunny and I had been accustomed to having another person in the house as well as two or three cats. So, deciding we needed a companion, I went searching for a puppy. When I brought Dawn home, Sunny wasn't exactly thrilled with the idea of an in-your-face puppy, but eventually she learned a manner or two--as puppies will--and they made friends. And how glad I was to have Dawn when Sunny died! She's five now and has gone completely deaf--something that can happen to Cavs--but she's still a healthy and happy companion. I'm rather deaf, too, so I understand. 2. What makes Dawn's tail wag? Food, walks, a good chase through the house after a walk is done, and going on play dates with her cousin, a Cairn terrier named Rikki. 3. What's your all-time favorite dog story? I guess it would have to be Lassie Come-Home, because it's the stories from childhood that stay. 4. If Dawn could change just one thing about you, what would it be? She would get me untied from that dang computer and taking more walks! 5. In five words, tell us what Dawn means to you: She is my heart's companion. That just sums it up, doesn't it? With the love of a dog, your heart can never lose its way. Many, many thanks to Marion and Dawn for visiting Fido and Friend in Five. Be sure to check out not only Marion's website but also her blog. Such great information for writers and those who's dream is to become a writer!